Rajiv Gandhi University (RGU) Vice Chancellor Professor Saket Kushwaha emphasis on skill development. Rajiv Gandhi University (RGU) Vice Chancellor Professor Saket Kushwaha emphasis on development of skill among all to earn for a livelihood, sustainable and economic development. Inaugurating the training programme as chief guest Prof. Kushwaha emphasized on skill development as priority area in Arunachal Pradesh, and urged the trainees of the two week training programme on medicinal plants hailing from different part of Arunachal Pradesh to develop skill on plant identification, cultivation and market linkages for socio-economic development of Arunachal Pradesh. He emphasized on need for synergistic approach in work culture by involving persons of different knowledge background such as medicinal plant experts, farmers, economists and commerce experts to bring about reliable output and generation of self employment avenues among the rural youth. He also tells that jobs in govt. sector is very limited which is saturating days by day. But Arunachal Pradesh is blessed with rich wealth of natural bio resources including medicinal plants which must used for socio-economic development of the people. He urge upon the youth must train up in different sectors including medicinal plants cultivation and management in such a way that they become a job provider instead of job seeker. RGU Registrar, Prof. Tomo Riba, attended the inaugural ceremony as guest of honour. 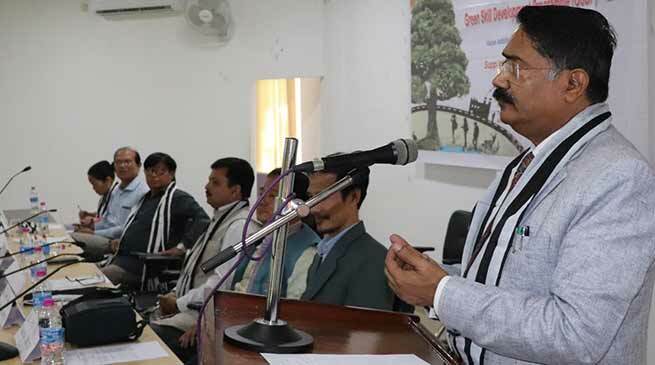 He urged the trainees to learn the techniques sincerely from master trainers and resource persons in these two week training course so that they become more practical in managing medicinal plant bio-resources which is precious heritage of the state. Head of Department of Botany Dr. Hui Tag and Training Director ENVIS-RGU Programme while informed the trainees on richness and relevance of skill based training on medicinal plant sector in Arunachal Pradesh. The training shall continue till November 26 and around 30 participant are taking part.